Sights. Camera. London. 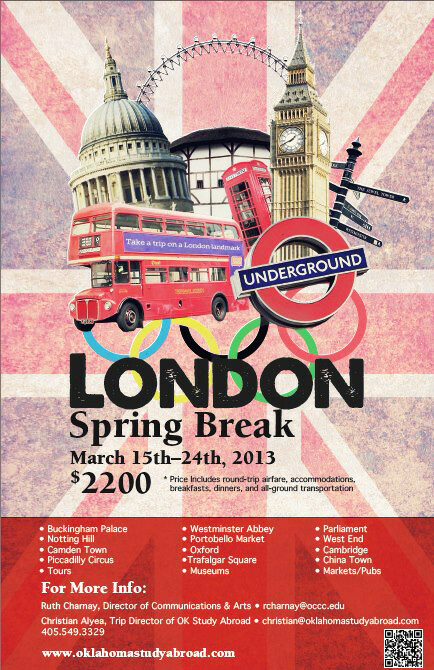 A spring break study-abroad course in London is available to OCCC students for $2,200. The Oklahoma Study Abroad trip runs from March 15 through 24. Students can immerse themselves in the theater of one of the world’s leading cultural hubs and earn one college credit in humanities. “It’s an individual experience,” Charnay said. “What I try to do is something personal to each individual taking the class. “Depending on what your interest is, I allow you to write a paper or have a discussion or something else about your interest. Travelers will have a chance to see Big Ben and Parliament. Trips to the re-creation of the Globe Theater, Stratford upon Avon and Nottingham will color the excursion with the distinctive air of England’s theatrical offerings and venues. “You’re stepping out and seeing things you see in the movies and they’re right there in front of you,” Charnay said. “London is big and it’s fast, but at the same time, there is a knowledge that the people have. There’s a very traditional feel, but it’s also very modern, and hip and cool. When packing for the trip, Charnay recommends keeping it simple, but said think about layers. Program Director Christian Alyea reminds students to do their research before traveling anywhere. There is room for students to join the trip and non-students may participate by taking one audit hour for an additional $100. Deadline for the first payment of $400 is Dec. 14. For more information, visit www.oklahomastudyabroad.com, or email Charnay at rcharnay@occc.edu.